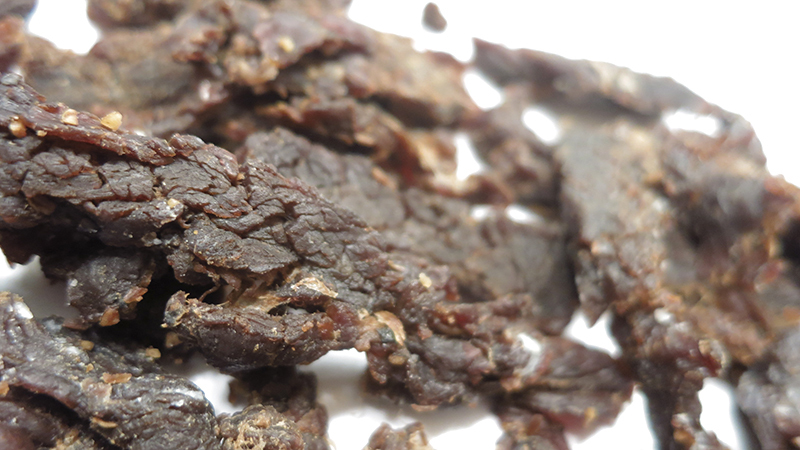 The first flavors that hit my palate is a smokiness, along with a beefy, fatty meat flavor. Soon, I can pick up a light salt, and a light garlic. The chewing brings on more of the fatty, natural meat flavors, but also touches of sweet and black pepper. 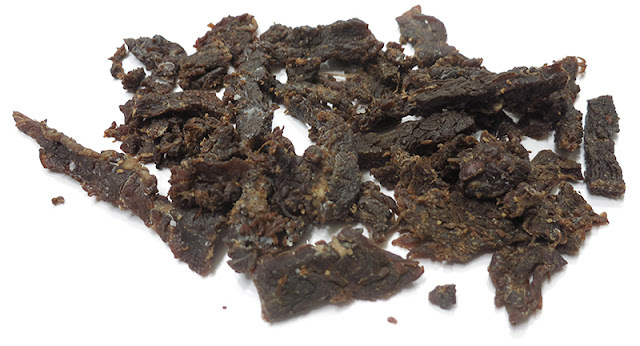 For being described as seasoned with "steakhouse spices", and as being the lowest sodium beef jerky on the market, it seems up to hold up. It certainly does have a seasoning reminiscent of steakhouse seasoning, though it's light. It's not the bold, spicy, seasonings where the black pepper, garlic, coriander, pop out at you. It's instead more subtle. It's also light on the salt, it's just barely there. Otherwise, the primary taste profile of this jerky is the natural meat flavors. It's more of a fatty, or marbleized, meat flavor. The natural smoke flavoring is light but noticeable, and then the seasonings of salt, garlic, and black pepper are a bit more light. 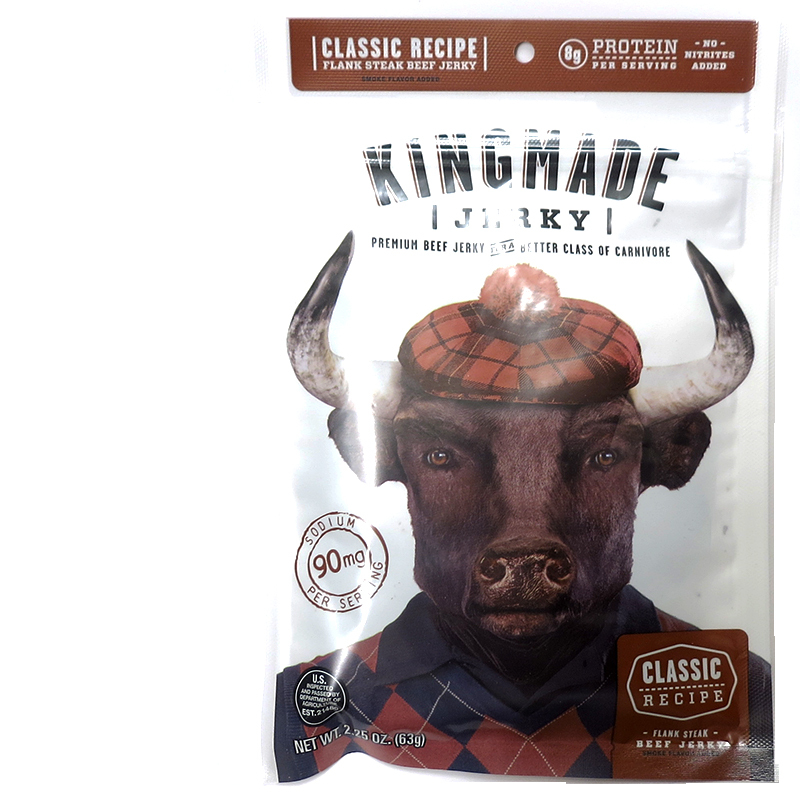 This Classic Recipe from Kingmade Jerky dishes out a very natural taste in that it's focused on the natural meat flavors, with some noticeable marbleized essence. The seasonings are light enough to add a little bit of steakhouse style seasonings, but yet allow the great taste of beef to remain focused. Overall, it tastes simple yet natural, ordinary yet addicting. The meat consistency and chewing texture is likewise, feeling like real meat, not gummy, not sticky, not hard. It's just somewhat dry. But otherwise, I was impressed for its natural character, the focus on the meat flavors, the marblelized taste, and the low saltiness.